"In the end, this is a symptom of a larger problem, a bubble-and-bust economy that valued reckless speculation over responsibility and hard work," Obama said in a statement released by the White House. "That is what we must ultimately repair to build a lasting and widespread prosperity." Citi has also been criticized this week for an estimated $10 million renovation of its executive offices, and reports that the firm was considering boosting salaries for its top executives. The bonuses for top executives at Citi are particularly surprising because the company is typically seen as the most in danger of failing among the nation's largest banks. Citi has received more government assistance than any other bank: $45 billion in cash infusions and over $300 billion in loan guarantees since late October. By comparison, none of Bank of America's top five executives will receive a cash bonus for 2008. Citi has long deferred the payment of stock options that are granted at the end of the year. Cash bonuses, though, have always been paid at the time they were granted, typically in January for prior-year performance. But this year Citi decided to defer bonus payments for the first time. Instead of paying a lump sum in early 2009 for 2008 performance, payouts would be spread over four years, with the first payouts in January 2010. For example, Forese, the Institutional Client Group executive, received a salary of $225,000 and was awarded a cash bonus of $5,265,000 for 2008. But he won't get any of his millions yet. Instead, he has a promise from Citi that he will get a check for $1.3 million in January 2010 and three checks for the same amount over the following three years. On the surface, the plan looks like a good public relations move. At a time when people are angry about bonuses, Citi can say it isn't currently handing out bonuses to its top executives for work they did in 2008. What's more, the Citi bonuses include a provision that allows the bank to "claw back" the money if it is found that an executive made false statements to the company. The problem is that Citi's payment plan is not consistent with executive-compensation rules put into place by the stimulus package. The American Recovery and Reinvestment Act signed by Obama on Feb. 17 says banks that have received money from the government's $700 billion Troubled Asset Relief Fund are barred from paying cash bonuses to their top executives. They can pay stock bonuses equal to as much as a third of an employee's salary, but the employee is not allowed to sell those shares until the government's money is paid back by their company. The rub is that a provision was inserted into the stimulus package that says the rules do not apply to any bonuses contained in employment contracts signed before Feb. 11. (It is this provision that AIG has cited in defending its controversial bonuses to top executives.) 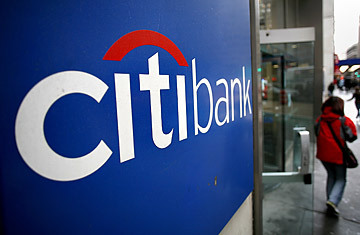 Citi finalized its plan for paying 2008 bonuses in January. But it's unclear whether Citi's deferred-payout plan would be considered a valid employment contract under the rules set out in the stimulus package. The law leaves that up to Treasury Secretary Tim Geithner to decide.